Gravestones are typically vague beyond name and date of birth and death, but if they include and an editorial flourish, most are laudatory. This can come in the form of a familial platitude: Loving husband and father; a religious bent: Asleep in Jesus; or an indication of virtue: Generous of Heart, Constant of Faith. A few, however, reflect mystery, sadness or even both. The search of old newspapers turned up some background on G.W. Dunn, and it is indeed a forlorn story. Under the headline “Man Suicides in Newberry,” The Newberry Herald and News reported on June 25, 1915, that Dunn killed himself in the city’s train station by drinking carbolic acid. He was subsequently buried in the city, even though he hailed from several hours away. Gravestone of G.W. 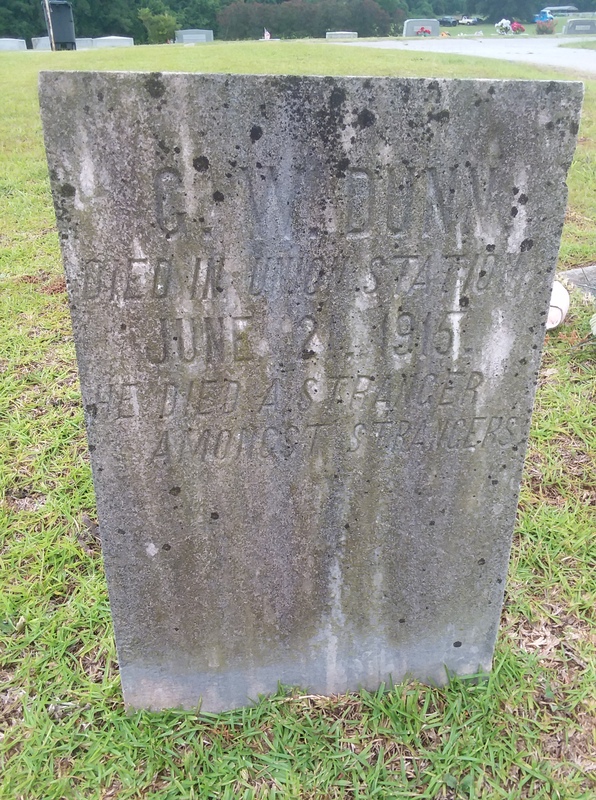 Dunn, buried in Rosemont Cemetery, Newberry, S.C. Round, S.C., today known as Round O, is located in Colleton County, not too far from Charleston. It was several hours travel from Newberry in 1915, even by train. He was interred in Rosemont Cemetery the day following his death, with a local minister conducting the service. That Dunn was down on his luck is apparent. The paper noted that he was about 35 years old, had one leg and went about on crutches. 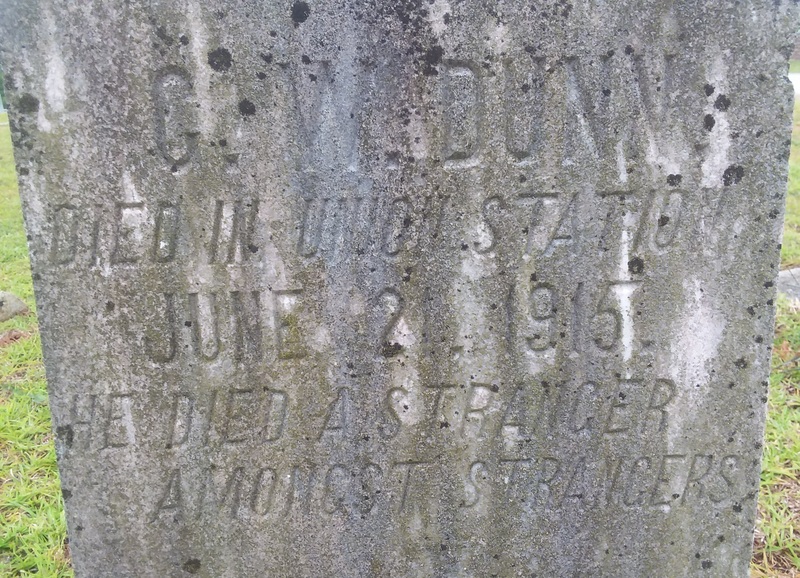 It didn’t appear Dunn had come to Newberry to end his life. He arrived in town earlier on the day of his death, from Columbia, about 30 miles south, and spent the day looking for work. He had eaten lunch at a downtown restaurant and left a bundle of clothes, saying he would probably return for supper. “It appears that the unfortunate man had tried to get work here,” according to the paper. “Mr. W.H. Hardeman of the Newbery Cotton Mill says he applied to him for a job, but there was nothing or him to do there, as machinery has supplanted the hand labor the man had been used to. He tried elsewhere for work, but failed. “In his despondency, lonely and friendless, the crippled stranger within our gates, with poverty and no work staring him in the face, perhaps without a home fit to be called a home, drank poison and died. He was given a decent burial,” the story concluded. Dunn had 40 cents in pocket when he was found. More than a century later, one cannot read of Dunn’s death without feeling a twinge of sadness. To end one’s days in a distant town, with one’s family unable or unwilling to foot the expense to have your body returned home inspires melancholy. G.W. Dunn rests today on knoll in one of the lonelier parts of the cemetery, the heartrending words on his tombstone faded by time. One can only hope that this “stranger” found some measure of peace in the hereafter. this is so incredibly sad. Very sad. And I think it happened a lot more than we realize. There was a different kind of safety net back then, but when people fell through, such as when their family was dead broke and hungry, the fall was often very long. Poor devil. Crippled, seeking work and, by the sound of it, with a family unable to help him, money only enough for a couple of meals…and a draught of carbolic acid. What a hideous death brought about by despair. This is why a decent society has a safety net….one which our far from decent governments are busy removing. Yes, there is a definite need for a safety net; I sometimes wonder, though, how well equipped the government is to manage it. Bureaucrats punching the clock and picking up their paycheck with no eye on the bigger picture. That’s why they throw money at some issues without rationale, then pull money from others, hurting people. Too many people in government interested only in lining their own products. I don’t even want to imagine how desperate one must have been to resort to carbolic acid. Awful. Some good sleuthing there. Suicide by carbolic acid was not uncommon. I have seen it referenced in many an old newspaper article. Despondency is not uncommon either. I am impressed that someone in Newberry was thoughtful and gave him some attention by placing a grave marker. It may be attention G.W. never received before. That is the pity here. Thank you, Barbara. I thought the same thing: At least someone was kind enough to put up a grave marker for this poor soul. This was likely a tragedy repeated more often than we would like to think in the days before we had a welfare system, no matter how flawed it may be. Thank you for a wonderful story. Indeed. It makes one glad for family. It is heartbreaking. And too many people only find out what they mean to others after it’s too late. After Leo Tolstoy learned of a similar incident in which a woman committed suicide by throwing herself in from of an arriving train at a station, he turned it into *Anna Karenina*. I did not know the genesis of Anna Karenina. Fascinating. And a wonderful book. Thank you for the note.